At every circumcision Elijah, "the angel of the covenant," as he is called in Malachi (iii. 1), is supposed to be seated at the right hand of the sandek, upon a chair richly carved and ornamented with embroideries ("kisse shel Eliyahu"). Even in the salutation to the child to be circumcised ( ) is read the invitation to Elijah . When, under the influence of Jezebel, circumcision in the northern kingdom was about to be abolished, Elijah is said to have retired to a cave. There he prayed to God (I Kings xix. 10), and complained that Israel had forsaken the covenant of the Lord; whereupon God ordained that no circumcision should take place except in the presence of Elijah. Some consider this to be a commendation of Elijah for his zeal; others, again, take it to be a measure of protection for Israel, in that Elijah is in every instance to be satisfied that the covenant is not being broken. Accordingly, the Shulḥan 'Aruk, Milah, 265, 11 (comp. Kol Bo, 73), orders that a distinct seat upon the bench, or a separate chair, be reserved for Elijah. 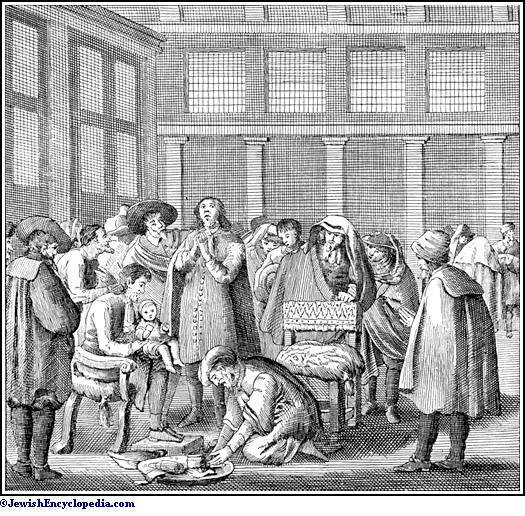 To this the circumciser (mohel) refers in the prayer preceding the circumcision, as well as in the piyyuṭ for the Sabbath on which a circumcision occurs. When the chair of Elijah is made ready, the words "This is the chair of Elijah" ( ) must be said in a loud voice. 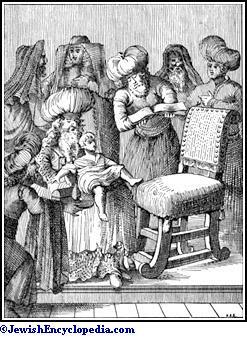 Before the circumcision takes place the child is placed upon the chair. 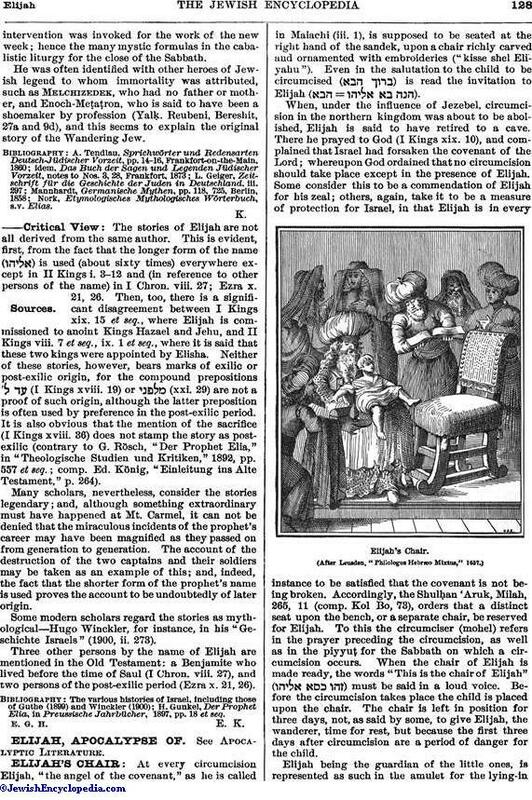 The chair is left in position for three days, not, as said by some, to give Elijah, the wanderer, time for rest, but because the first three days after circumcision are a period of danger for the child. Elijah being the guardian of the little ones, is represented as such in the amulet for the lying-inchamber, and, indeed, it is in this capacity that he is invited to the circumcision. In Regensburg R. Judah the Pious was once entrusted with the office of sandek. 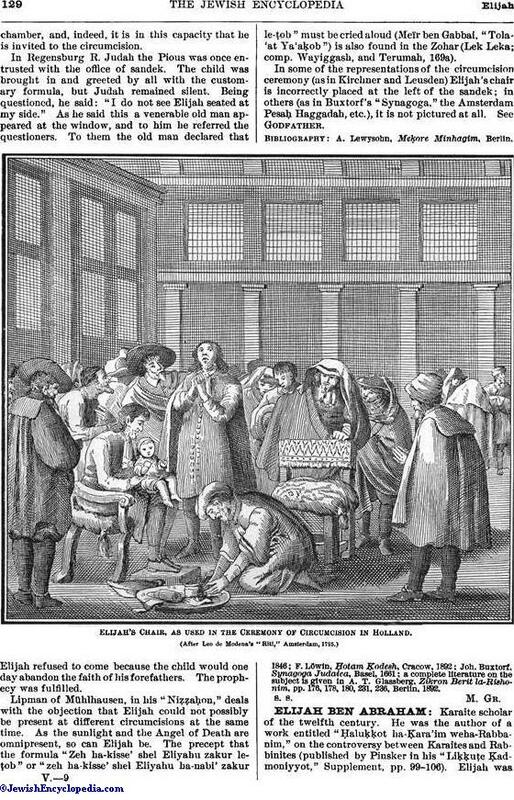 The child was brought in and greeted by all with the customary formula, but Judah remained silent. Being questioned, he said: "I do not see Elijah seated at my side." As he said this a venerable old man appeared at the window, and to him he referred the questioners. To them the old man declared that Elijah refused to come because the child would one day abandon the faith of his forefathers. The prophecy was fulfilled. Lipman of Mühlhausen, in his "Niẓẓaḥon," deals with the objection that Elijah could not possibly be present at different circumcisions at the same time. As the sunlight and the Angel of Death are omnipresent, so can Elijah be. The precept that the formula "Zeh ha-kisse' shel Eliyahu zakur leṭob" or "zeh ha-kisse' shel Eliyahu ha-nabi' zakur le-ṭob" must be cried aloud (Meïr ben Gabbai, "Tola'at Ya'aḳob") is also found in the Zohar (Lek Leka; comp. Wayiggash, and Terumah, 169a). In some of the representations of the circumcision ceremony (as in Kirchner and Leusden) Elijah's chair is incorrectly placed at the left of the sandek; in others (as in Buxtorf's "Synagoga," the Amsterdam Pesaḥ Haggadah, etc. ), it is not pictured at all. See Godfather. a complete literature on the subject is given in A. T. Glassberg, Zikron Berit la-Rishonim, pp. 176, 178, 180, 231, 236, Berlin, 1892. Elijah's Chair, as Used in the Ceremony of Circumcision in Holland. (After Leo de Modena's "Riti," Amsterdam, 1725.)S. S. M. Gr.